Why are wordless picture books ever so beautiful? Perhaps it's because they have such a reliance on image to impart story ... there's certainly no skimping on beauty and technique and illustrations that inspire and enchant. 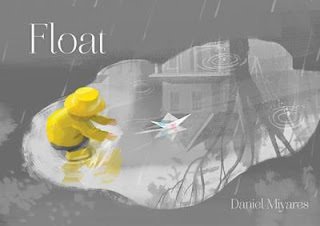 Daniel Miyares has created a fine addition to the wordless picture book fold with Float. Following the travels of a young lad as he takes his newspaper boat for a spin in the rain puddles outside his house, the colour and vibrancy of his movement and joy is palpable. With splashes and sploshes, a downpour, plenty of glassy reflections and a striking yellow raincoat against rainy grey backgrounds, the varied points of view and angles make for a fluid, high-engaging story. Landscape in orientation, the book's pages are beautifully broken into full double page spreads of full or deceptively simple scenes, as well as comic-strip style layouts that heighten the energy, right before another simple pause. This is a masterful book that will bring pleasure to all ages. When our young lad plummets from elated playing to a ruined paper boat, we feel for him as he trudges home and is embraced by his dad, only to be shown another exciting way to fold paper and enjoy the great outdoors once again. This is a warm, beautiful tale, with subtle messaging about sunshine after rain.